Thread: Charity Quilt help please! I was just made aware of a fundraiser being given for the family of one of the girls on my daughter's college soccer team. They are looking for chinese auction items and larger items to raffle off at a dinner to raise money for the family because this girl's father was diagnosed with stage four stomach cancer. The family has 6 children, aged 21-6. I have always been amazed to see them show up at soccer games with each kid wearing a different jersey from some team that they were involved with and the parents always so supportive and involved with each child... a truly awesome family. I was trying to think of something I could do to help and I was thinking about maybe donating a quilt. If I do, how will I know what I can do that will appeal to the largest number of people. It needs to be quick enough that I can make it and have it quilted and finished by early October, too. I'm not an expereienced quilter, but I have been sewing for years. I'm sure that many of you have a lot of experience with things like this. Any suggestions as to size, color, patterns? I'd really appreciate it. I'd really like to be able to do something good to help this family and with my husband out of work, I don't have much in the way of money that I can donate. I know the quilting will cost me, but I was hoping to use as much from my stash as possible. Off to work now and hoping that you guys will have some suggestions for me when I get home. Thanks so much...this community here is just the best! I appreciate your help! 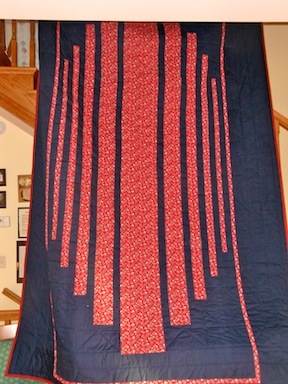 A quick quilt would be Stacked Coins - it will use strips of your scraps in the stacks. The sashing could be white, which will go with everyone's decor and could even be used as a baby quilt. I have several favorites but if you want quick, check out the Quilt in a Day patterns.I'm sure that whatever you come up with, will be appreciated. If you need help with fabrics, post an ad in the donations or request section on the board. I'm sure you will find plenty of help there. PM me with your address and I'll kick in some fabric. I recently had the same problem for a little girl's fundraiser. I wanted to do something and didn't know what. I used child's print fabric, uncut, and fleece backing that matched the colors but not the design. There was no batting and I just quilted it diagonal lines. I was later told that everyone loved the quilt and it brought one of the higher prices at the auction. I couldn't attend so I was relying on someone else's opinion. So happy to be able to help. It was also already in my stash. I recently did 2 fundraisers for 2 two yr. old little girls. I made D9P for both. What we did was sell the raffle tickets ahead of time for both. Sold $535 for the first and $620 for the second. Then at the actual events the quilts were on the auction table with the rest of the prizes. I had roll tickets the same that would be used at events and same price, 5 for $5. Quits are a lot of work to put on a table with gift baskets. The Warm Wishes pattern is fast and easy. Use a focus fabric and 3 coordinating fabrics. Disappearing 9patch is fast and you can get so many different effect depending on the fabric you use. You could easily get it done by October. You could use sport related fabric or gear it more to girls or just solids or whatever you want. I agree with disappearing nine patch. It can look dramatic. But is really easy. Pick neutral colors that have interesting patterns and a some that are simpler patterns to give your eyes a place to rest. I would look at Missouri Star site. She does many quilts that only use one layer cake. 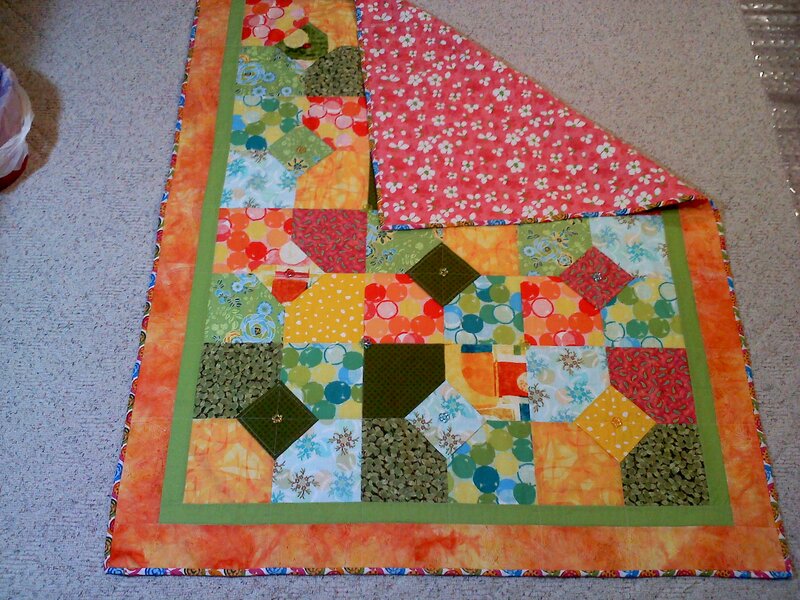 The quilts are all so easy and fast, but look great. A layer cake isn't too expensive, but you can make your own from your stash. Win Win in my opinion. 1600 quilts are quick and easy. My experience is with our annual Bible camp quilt auction. You can't guess the color schemes in peoples' homes, but people always seem willing to spend money on quilts they can give as gifts to grandchildren. Therefore, smaller kid themed quilts with novelty fabrics are always popular. People like quilts with a wow factor. Also, quilts made from local team colors sell well, as do denim quilts, zebra prints, wildlife prints (for cabins), pink, purple, lime green, etc. Disappointed donors are those who have put in a lot of time (such as hand quilting). The general public seems to be looking for eye appeal. Not too many are willing to spend enough to cover hand quilting costs, and the cost of a long arm quilter also may not be recovered with enough spare to make much of a profit. These are just my opinions based on several years. However, localities and audiences differ. And if you are selling quilts to an audience of quilters, such as at a quilt show, that is completely different. I would investigate to see what has sold before and what price. I did the same for a Chinesee Auction for a local library. I don't kow how many tickets were in the box but I am sure I was disappointed in what was actually raised on my quilt. It was a fast pattern but I still spent several hours on it. I just don't want you disappointed. I think even if you do a scrappy nine patch and then tie it, it will bring in a lot of bids. Sometimes those are the best because it takes the least time, uses your scraps, and it would fit with a lot of peoples décor. Also, if it is tied, you won't have to put out the expense of having it quilted. Please let us know how you make out and a picture of the final quilt will be great. Good luck - hope you make a lot for this family. I agree, a D9P is really simple. And depending on your fabric placement, they can be stunning. If you see the PBS special called Quilts Of Valor, you will see Eleanor Burns teaching a person with no quilting experience to make on for a wounded soldier. Just decide how big of a quilt you want. Some cut 5" squares. I prefer cutting 6.5" squares. Good Luck and keep us posted. We are all here to help!! Go for a quilt that has a neutral background and think of something that either represents the area you live, ex farmland, or just make it really colorful. civil war fabric would be good for some area's those pretty 30's prints for other area's, batik's might be nice. I saw a really pretty colorful log cabin being raffled once. 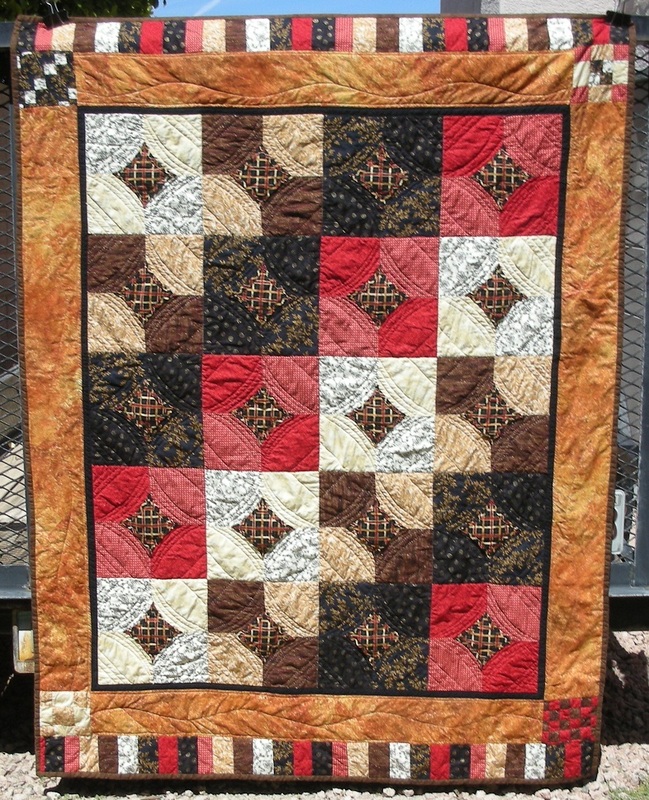 The quilt I've done that has gotten the most compliments is a carpenters star (wheel). It went together very quickly and easily. All large HST and squares. I did it in two shades of blue for the center star and two shades of green for the wheel and then added a third shade of blue with one of the first two for the second wheel all on a white on cream background. Then alternated the colors in the borders too. Sorry the picture was in my phone that I lost. Agree, that a sports related theme might be good. Also, generally anything patrotic, red/white/blue is appealing. There's easy patterns a plenty. Just pick one that makes you happy and go for it. **And ((hugs)) to you for doing such a wonderful thing for this family! I would make a lap size or baby quilt. They use a lot less time and fabric. I just made a couple of Xs and Os quilts (Missouri Star Quilt Co tutorial.) They were very easy and look great. They use 5" squares. I used scraps for the Xs and Os and muslin the for background. I would suggest a 10 Minute Block quilt. The patches go together really fast, easy to cut and look nice. It's also easy to machine stitch on a HSM if you don't have a LA. Stitch in the ditch and X's across the patches look nice. (I added buttons,because it suited the fabric.) Here's the link to the tutorial on YouTube and a photo of the one I made. It is lap sized and sold quickly. Hope this helps you! I agree with the 10-minute block. It may take longer than 10-minutes but worth the effort. Better to do something imperfectly, than nothing perfectly. I am making a double Irish Chain for a raffle right now. Great contrast, very easy, appealing to everyone. This so nice of you. Go to u-tube and check out the 10 minute quilt blocks. They go together fast and look like you spent a lot more time. I put a top together in less than 3 hours. You can then just pick your quilt pattern. I haven't done my top yet, but plan to do an echo. Good Luck. I saw this quilt pattern on this board done in Oriental fabric. Here is my version done for the back of my daughter's quilt. The "boxes" can be made any width to showcase fabric. Good luck and God Bless. Delaware County, SW of Phila. If you want something fast and easy, try doing large squares with maybe sashing in between. You can make them as large or small as you want. I do these when I am donating quilts. They are not fancy, but they are very well received.